MILO—Taxpayers in Milo can say "Charge it" when they pay their taxes early next year, but tax transactions paid by credit card will carry a three percent fee to offset the amount charged to the town by credit card companies. The transaction fee was passed at the Dec. 15 meeting of the town board. • Board members voted unanimously against adoption of a proposed outdoor furnace law. Supervisor John Socha asked councilman Dale Hallings to take it in the present form and find the considerations that need change. Socha said he would like to see as little change as possible because of the amount of work that has already been done on the law. The town planning board has been working on it for about 18 months. One of the concerns is setback requirements. • The board heard an update on the Himrod 1 Water District from Greg Cummings of Larson Design Group. Although the state health department has approved plans, the town is still waiting for a green light from the state Department of Environmental Conservation (DEC). Cummings said the delays have been, "Quite frustrating." The town's first application to DEC was lost by the agency. Milo did receive permission to put the project out to bid. During discussion the board also heard concerns about easements from resident Jonas Stolzfus. • Engineer for the town Wayne Ackart reported there was another saddle failure in the Milo water district, the first in nearly a year. The repair will cost $2,100 plus the cost of parts and labor. Saddles that failed in the district were extremely corroded. Ackart said the town will probably never know the cause of the failures. • Socha thanked all board members, staff and committee members for their service during the year, commenting, "When you think about it we have an awesome town." • The year end meeting of the town of Milo will be at 5:15 p.m. Dec. 30. The next regular town board meeting will be at 7 p.m. Jan. 20. 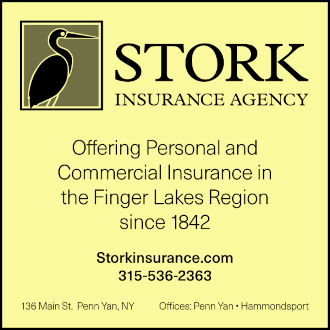 Both meetings will be in the town hall on Main Street in Penn Yan.